Request Yorkville Grand Condo. We will contact you shortly about next steps! 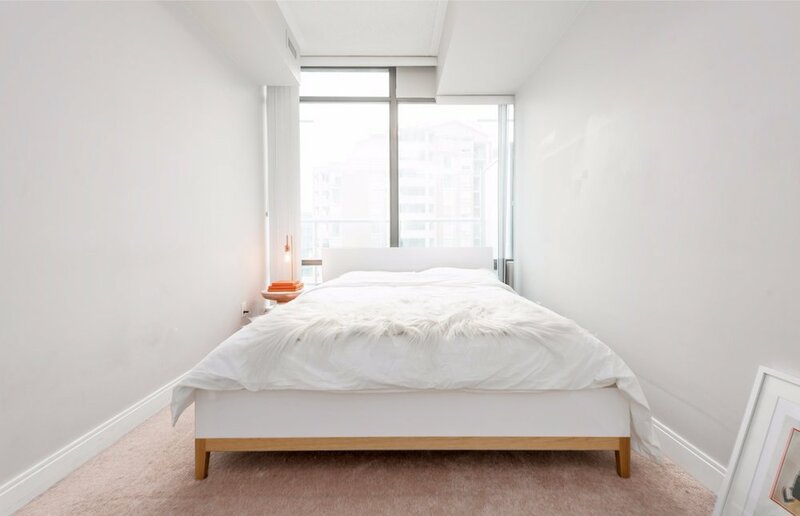 An elegant and modern 1 Bedroom condo in the best part of Yorkville, the Yorkville Grand Condo offers the comforts of your home with an impeccable design and premium furniture. 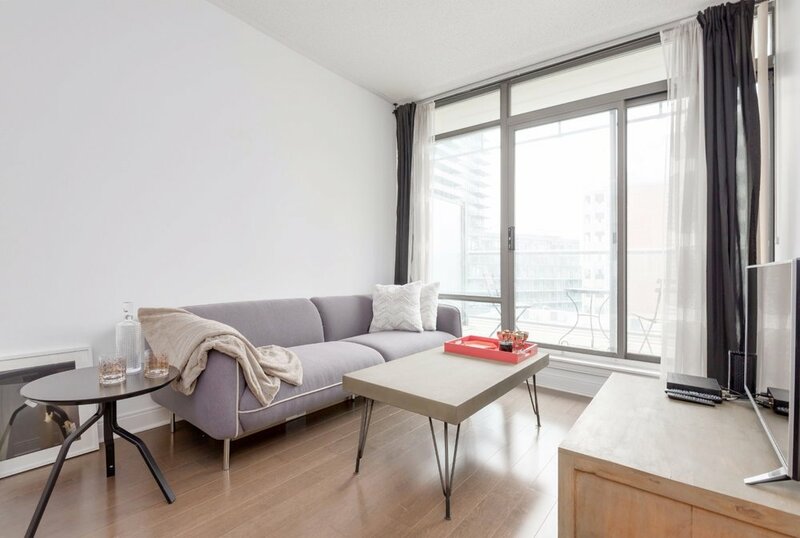 This luxury furnished rental apartment is approximately 650 square feet and has a large walk-out balcony facing East. 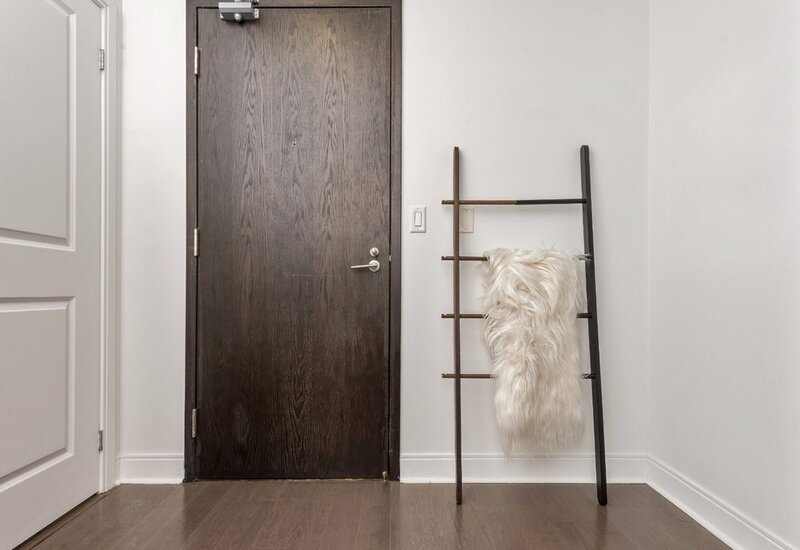 One of our most stylish furnished short term rentals in Toronto, the condo has stylish elephant grey hardwood floors throughout the suite and plush carpeting in the bedroom. Relax on the charcoal grey 3-seater premium tailored upholstery sofa in front of the 43 inch HDTV. The bed is a plush Queen size mattress and all bedroom and bathroom linens are provided. The kitchen is fully stocked so that you can easily cook at home during your stay. We use only premium furniture in our suites, with a focus on design and comfort. This suite is part of our private Yorkville Furnished Apartments Toronto Collection. We offer flexible lease terms. An exit cleaning fee of $110 applies. Parking space can be added for $200. No additional taxes or fees apply to furnished rental stays. Your luxury furnished condo is located in the most prime location of Yorkville, the "Fifth Avenue" of Toronto. The city's best shopping and restaurants are within a 5-minute walk from your furnished apartment, including Holt Renfrew, Gucci, Louis Vuitton, COS and high-end restaurants like La Sociéte, Cafe Boulud, and Buca Osteria. You will also several grocery store options in your immediate vicinity and walking distance.